Everyone likes a smoothie. It is cool, refreshing, and can be healthy as well. Because I wanted to be a good steward of my body I enjoy a smoothie as well. Of course, here in the islands we have to make our own. Several people would make them for me, and from time to time still do. Now that I have my own blender, I am making my own. Using fresh ingredients, fruits and veggies it is quick and easy to make. Now, I am not trying to sell you on smoothies. That is not the point of this blog. While in the states on this last trip I noticed how many places there are that make smoothies. Tropical smoothie, Jambo Juice, Smoothie king and others are full time, “healthy smoothie”, businesses. You can go in and literally be in and out in minutes. A power packed replacement meal, energy, or just a cool drink. After visiting, the Spirit got my attention and I began to notice a couple of things. First of all, it was fast, in and out! Second, there were set recipes but you could add, take away, or change however you wanted to. Lastly, there is no conversation with others involved it is in most case a completely individual process. No social interaction involved or needed. As a matter of fact you do not have to even work at digestion! Societies need to continually maximize time for work and pleasure. This need to become more productive in these areas has created the need for the ultimate fast meal! It literally can be loaded with everything your body needs, and is finished in less than ten minutes! Unfortunately, this trend has filtered into our everyday life! Societies are driving people to move faster and faster everyday. Patience is not normal today! Everyone wants a quick fix, and an instant resolution to every situation and problem. Most people are digitally connected on many levels! Everywhere you go around the world, people are texting instead of talking. Smart phones are the norm, and the bulk of those are constantly monitoring social media! To cut down on the time it takes to communicate, we have shortened words and use emoticons to express our feelings. Even though we are connected in so many ways, we have become more and more disconnected from each other. We do not have time for personal relationships! The truth is, we would rather text, tweet, or email than we would to sit down and talk! Sadly, this has filtered into the church and our relationship with the Lord. Someone is saying right now, “You live on an island, and you do not understand”! “Really?” For the record, I use social media and text, so I am connected. However, what I see when I look at the trends in churches, I can see a negative effect. I am blessed to be a part of a church that has a pastor who is concerned about people, relationships, and does not rush the moving of the Spirit of God! That type of church now is not the norm for today. Most churches have become smoothie churches. Concerned about time, and the trends of today’s world. They try to pack everything together in the shortest amount of time as possible! Just like a smoothie, you can pretty much have it your way. You do not want to hear about sin, hell, end times or living righteously; there is a church for that! You want a church that is heavy on worship and light on the truth; there is a church for that! You want a church that compromises the Word and accepts any lifestyle that comes in the door; there is a church for that! Need one that combines all of the religions together, oh yeah, they got that one to! Bottom line, whatever church you are in needs to teach the whole truth and not just what you like! The truth will set you free! Ask yourself this question, “Why am I in such a hurry?” ” What am I in a rush to do?” Most people have time for every pleasure under the sun, but minimal time in the house of God! When they are there they want it quick, get all the right answers,and have minimal contact with others. The smoothie trend in the church is not producing healthy relationships with God and with others! 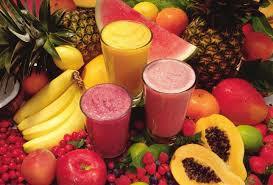 Smoothie churches are made up of individuals, and neglect working together as the body of Christ! That is a fact in some churches, but you can make a correction. I want to give you a challenge that I believe will change your life. I challenge you to do the following things for one week. I guarantee you will see a change in your life and in those around you! 1. Spend one hour everyday with God! Just stop for one hour. read the bible, pray, take a walk, or just be quiet in the presence of God! 2. When you go into church, leave your digital connections in the car or turn them off. Amazing what will change if you open your ears and eyes to focus on God! 3. Take time everyday to sit and have a real conversation with a real person. Talk to your friend or your family member in person. Sit down and have a discussion about anything. No shortcuts or emoticons involved. Get in touch with a real person! Let me leave you with this, smoothies are great every once in a while, but a diet of just smoothies all the time will eventually be boring and drag you down. Get in touch with life and take time to live a life pleasing to God! Hebrews 10:25 (NLT) And let us not neglect our meeting together, as some people do, but encourage one another, especially now that the day of his return is drawing near. Psalms 46:10 (KJV) Be still, and know that I am God: I will be exalted among the heathen, I will be exalted in the earth. Leave your thoughts or comments and I will get back with you…… God bless! Thank you my friend, have a blessed day. Previous Previous post: Time Keeps On Slipping! Next Next post: The 65 Million Dollar Question!